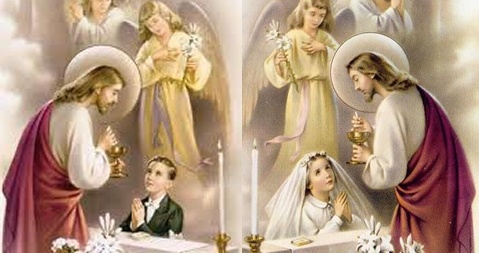 First Communions: Welcoming Jesus In Our Hearts! A joyful dazzling white army of 86 boys and girls, defying threats of rain, gathered at “Rufus King Park” on the early afternoon of Saturday, May 12, 2018, to start getting organized for the public procession which would lead them to our Church of Presentation of the Blessed Virgin Mary, where they were to receive the most sacred Body and Blood of Jesus our Lord. Joyously singing “This is the day the Lord has made” (from Psalm 118), the children greeted our neighbors and persons on the streets on their way to the Church, where Mass promptly started at about 3:00 PM. The celebration was presided by our pastor, Rev. Manuel de Jesús Rodríguez and concelebrated by our parochial vicar, Rev. Victor Manuel Bolaños. All the children’s catechists attended, presided by Ms. Beverley Madar, our director of religious education. At the end of the Holy Mass, and to the thrill of everyone, the children honored the Blessed Mother with a special “May Crowning” deploying a special “climbing squad” to the statue of the Immaculate Conception located inside our Church building.